History and background spent the majority of his younger years playing sports (Karate, Basketball, Soccer and Hockey), and even went on to represent Victoria 3 years in a row, and play A grade State League as a Hockey Goalkeeper. After a grueling training/competition schedule, and a couple of disheartening injuries, Mac begrudgingly decided to hang up his Goalkeeping mitts and pursue his other interests, including playing and touring with his band, traveling and working with orphans and underprivileged communities in the third world, and finally working in the lucrative internet Domain name industry in Hong Kong. It wasn’t long before Mac longed for what hadbeen missing in his life; hard training, solid competition, and a healthier lifestyle. It was at this point that Mac decided to turn things around and get back to what he had been missing. He got busy with outdoor circuit training, Muay Thai Kickboxing, Brazilian Jiu Jitsu, Boxing, adventure races, marathons and resistance training. Mac as a Trainer / Better Life Coach Being fairly new to the health and fitness industry, Mac has gained some valuable international experience as a personal trainer.In the corporate-expat culture of Hong Kong, Mac was trained, certified and indoctrinated to the world of health and fitness coaching.Kevin Faulk It was here that Mac found his passion for helping people reach a better quality of life, and sustain it Mac loves nothing more than to help guide/direct clients and friends towards a healthier and happier life. He has seen some amazing results through his clients’ progress in his short time as a Personal Trainer, and only hopes to build on those experiences.Mac understands that there are any number of limiting factors and proverbial mountains to climb, which make your goals seem unachievable; he uses this understanding and empathy to help break down the barriers, and put one foot in front of the other towards a healthier, happier life. 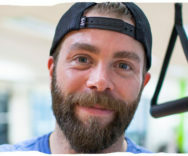 Mac is a firm believer that we are always learning and growing as human beings, and is intensely hungry to keep learning and growing as not only a Personal Trainer, but as a Better Life coach as well. Mac is thrilled to be a part of the Fitline team, and to grow his knowledge, skills and experience alongside the top trainers in Melbourne. Certifications Bachelor – Recording Arts (hons) Graduate Diploma – Community Development NASM – Certified Personal Trainer TRX Suspension Training – Certified Trainer Poliquin PICP – Level 1 & 2 Strength Coach Metabolic Precision – Level 1 Nutritionist FMA – Level 1 Achievements 2 years experience as a Personal Trainer State level Hockey Goalkeeper 5 International Adventure Races/Marathons Multiple Third World Volunteer Projects Record contract with Sony BMG Records Being an absolute friggin legend.